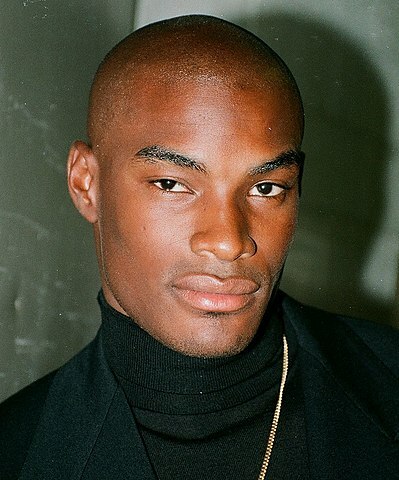 Tyson Beckford was born in Rochester, New York, United States, on December 19, 1970, is an American male model and actor. He was discovered by model scout Jeff Jones in New York's Washington Square Park in 1992. He became the first black man in advertising campaign for Ralph Lauren in 1993, modelling for the brand for five years. Long time highly ranked on Top Icons Men and Supers Men List by models.com. Vogue named Tyson the greatest male model of all time. Beckford's hobbies include racing and cars. He is of Afro-Asian descent. He was in relationships with celebrity stylist April Roomet (1997-1999), they have one son. He dated Australian model Shanina Shaik (2008-2015). Lives in Harlem, New York City and Jamaica. Featured in several music videos including Toni Braxton "Unbreak My Heart" (1996), Britney Spears "Toxic" (2004), Pet Shop Boys "Go West" (1993), The Notorious B.I.G. "One More Chance" (1995), Toni Braxton "Breathe Again" (1993), Ludacris "Act a Fool" (2003), Mariah Carey "Infinity" (2015), 50 Cent "21 Questions" (2003). He made his big screen debut in drama film Boricua's Bond (2000). And Men Magazine, Cosmopolitan U.S., Attitude, 7TH Man, V Man, WWD Magazine, Vogue, GQ Germany, Glass Magazine, OOB Magazine, IO Donna, New York Times, Details, Paper Magazine, Esquire U.S., Essence, UPTOWN Magazine, Krave. Barneys, Polo Ralph Lauren, Salvatore Ferragamo, Calvin Klein, Tommy Hilfiger, Pirelli P Zero. Walked runway for Alexander Wang, Greg Lauren, David Tlale, H&M, Fashion for Relief, Michael Costello, Chris Aire, amfAR. Represented by agencies New York Soul Artist Management, Milan d'management group, Hamburg PMA. I remember walking into Ralph Lauren for the first time, and seeing only white guys there. I was the only black guy in the whole casting. And they'd give me that look, like what are you doing here. People think you’re like, you whisk around a fancy car. Like, nah, I used to take the train to go shoot Ralph Lauren ads. It’s not all that glamorous, but the pay-off is great. People still come up to me. Little kids come up and say, "Hey! You were in Zoolander!" It's like, "How old are you? How do you know about Zoolander?" To me, it's amazing, and I would love to do it again.